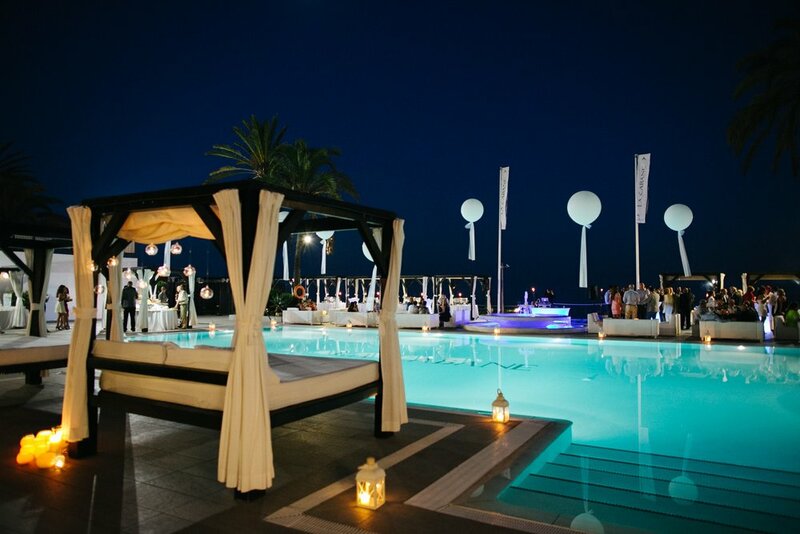 Imagine this: You are planning your dream wedding in Spain. Location-wise you’ve always envisaged something special, unique; a place right next to the beach, a frontline setting that will make your wedding absolutely unforgettable. You’ve dreamed of candy bars, fireworks, a great DJ, stalls with mojitos and sushi, as well as stunning floral decoration and picturesque gardens. If this is a glimpse of your imagination then we can tell you that we may have just found the answer to all your wishes at La Cabane, the luxurious beach club at Los Monteros Spa & Golf Resort in an exclusive and glamorous setting on the Golf Mile, situated amongst several high-quality Golf courses. When we visited this stunning wedding venue, we were taken back by the perfect combination of modern design and picturesque views. The large terrace and pool area fits up to 120 guests and promises the best drinks reception with a direct view onto the sea. But even if you were thinking of a more intimate, private event, La Cabane has the answer: La Luna is an indoor open-plan space with a beautiful view guaranteeing you all you could wish for on the most magical day of your life. It’s not just the location that shines at La Cabane. Moreover, we absolutely adored the team who were available at our disposal to advise us. We loved their personal approach and felt comfortable that they would create a celebration like no other.